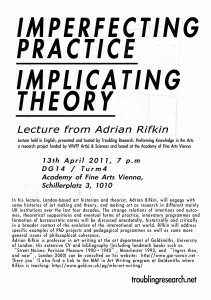 In his lecture, London-based art historian and theorist Adrian Rifkin will engage with some histories of art making and theory and and making art as research in different mainly UK institutions over the last four decades. The strange relations of intentions and outcomes, theoretical suppositions and eventual forms of practice, innovatory programmes and formation of bureaucratic norms will be discussed anecdotally, historically and critically in a broader context of the evolution of the international art world. Rifkin will address specific examples of PhD projects and pedagogical programmes as well as some more general issues of philosophical coherence. Rifkin is currently working on a book length text provisionally titled “Losing myself”. This is a series of engagements with and against the autobiographical as the figure of an archive – whether historical, theoretical or imaginary. Each section will be an attempt to map or interrogate moments of Rifkin’s own life against their determinants, conditions or outcome, but in such a way as to secure diffusion rather than focus, dispersal against coherence and logic, complex series of uncontrollable ‘events’ rather than sensible narratives. In doing this Rifkin wants to explore how what we call cultural theory becomes possible in a description of living, but as if living is not what belongs to oneself. This entry was posted in Research as a Mode of Operation, unthreaded and tagged Adrian Rifkin, ambivalence, appropriation, archives, artistic research, by law, collaboration, collage, deistituzionalizzazione, epistemic politics, Holert, The Crying Commodity, the form of theory. Bookmark the permalink. Both comments and trackbacks are currently closed.